Vietnam’s paddy fields and distinctive rock formations are major attractions for tourists. As Vietnam celebrates 40 years since the end of what is commonly known elsewhere as the ‘Vietnam War’, its government faces accusations of failing to ensure the rights of its citizens to religious freedom. These words, attributed by Open Doors to a Vietnamese Christian whose name was withheld, provide an insight into a country which, on the one hand, is reportedly close to making positive reforms to its laws on religious practice, but on the other is accused by the UN of “gross violation” of religious freedom “in the face of constant surveillance, intimidation, harassment and persecution”. Where Vietnam is concerned, religious freedom is rarely black and white. Consider the “cautious optimism” of Nigel Cory, a researcher at the The Center for Strategic & International Studies, who suggests “the space for religious freedom [in Vietnam] seems to be growing”. Cory says the appointment by Pope Francis of a Vietnamese archbishop, Pierre Nguyen Van Nhon, as a new cardinal was a “boon to the Catholic community in Vietnam”. He also references the formal “restarting” of 115 new Catholic and Protestant churches in 2013, up from 20 in 2012 and five in 2011, and Vietnam’s approval in 2014 of the Church of Jesus Christ of Latter-day Saints. 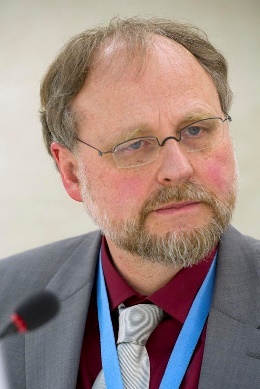 Heiner Bielefeldt, the UN’s Special Rapporteur on Freedom of Religion and Belief, seems to agree in part, when, in his January report, he acknowledges “positive development”. However, his other comments are less complimentary. Of his visit to the country in July 2014, Bielefeldt says “some individuals whom I wanted to meet with had been either under heavy surveillance, warned, intimidated, harassed or prevented from travelling by the police. Even those who successfully met with me were not free from a certain degree of police surveillance or questioning. These hardly sound like reasons for optimism. Müller references the “more than 70 Montagnard Christians from the Central Highlands” who “fled to Cambodia” only for “most of them to be sent back to Vietnam … and handed over to the authorities”. “It is better to die of starvation in the jungle of Cambodia than to suffer persecution in Vietnam,” the Montagnards are quoted as saying, after reportedly hiding without food in Cambodian forests infested with malaria-carrying mosquitoes. “The news on the Montagnard persecuted Christians shows that the Vietnamese government still has serious problems with ensuring freedom of religion and belief for all ethnic and religious groups in the country,” says Müller. “It should be noted that [Bielefeldt] was hindered from meeting with contacts in Gia Lai province, the province where the Montagnards fled from,” he adds. Open Doors reports the surveillance and subsequent arrest, in March 2015, of two leaders of a “house church” (a gathering of Christians at a private home) in Vietnam’s Yen Bai province in the northeast. Also in March, Open Doors reports a raid on a different house church, during which the 80 Christians were “ordered to stop their worship service”, while the owner of the house was taken to the police station and forced to sign a document making it illegal for him to conduct church activities at his home. Open Doors also reports a brutal February attack by police on Christians in the northern Dien Bien Province. Scared, the Christians fled the village. “The village government threatened to beat them again if they return,” Duonh explained. Again in March of this year, Christian human rights lawyer, Nguyen Van Dai, who was recently freed from four years of house arrest (which followed four years in prison on a charge of “conducting propaganda against the State”), reported regular intimidation by Vietnamese security officers. Then in April, Open Doors reported that two Christian families in northwest Vietnam have been threatened with eviction from their homes and had their pigs – their main source of livelihood – confiscated. The families are said to have lost the equivalent of $600; their government-issued health cards were also taken away. “It started when the families embraced faith in Jesus and quit worshipping spirits like the other villagers,” said a local source, whose identity is also being protected. Vietnamese Christian lawyer Nguyen Van Dai, pictured (front right) in Hanoi’s People’s Court in 2007, spent four years in prison for ‘conducting propaganda against the state’. He was recently freed from the house arrest that followed his imprisonment but says he is still regularly intimidated by security officers. For some Vietnamese Christians, police raids and surveillance by the government are a regular and expected part of life. Open Doors quotes the wife of a pastor of a Saigon house church, which has been in operation for 25 years. Weekly raids followed by a license? Another example of Vietnam’s complicated relationship with its religious communities. Indeed, the pressure against Christians in Vietnam is sometimes buried beneath the surface, or better or worse in certain areas. For example, Anh says Christians in major cities enjoy greater freedom. “At the moment, in [Saigon] and other cities, it’s easier to be a Christian. But in the rural areas and particularly for people from indigenous tribes, it’s very difficult,” she says. And difficulties don’t always arise from authorities. Converts to Christianity, particularly those from indigenous tribes, face “a lot of difficulties” with their families and neighbours, says Anh, which, for those whose families belong to the animist faith, can include pressure to take part in rituals. So what to make of Fides’s report that Vietnam’s government is “considering the possibility of reforming the law regulating religious communities in the country” for a “more open approach” which would “reduce restrictions which are currently in force”? “Several changes” were promised by Vietnam’s Government Committee for Religious Affairs at a meeting with religious scholars and officials on 15 April. Whenever the new version of the law does surface, and whatever the finished version looks like, there will be a range of interpretations, while consequences may not be immediately apparent. Vietnam is No. 16 on Open Doors’ 2015 World Watch List, which ranks the 50 countries in which life as a Christian is most difficult.